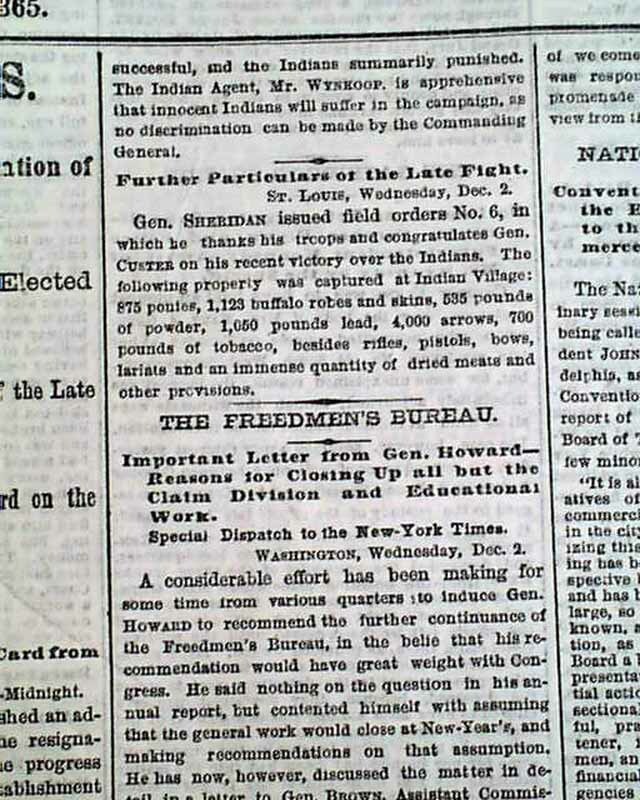 The front page has: "The Indian War" "The Recent Fight--Gen. Sheridan's Official Report." 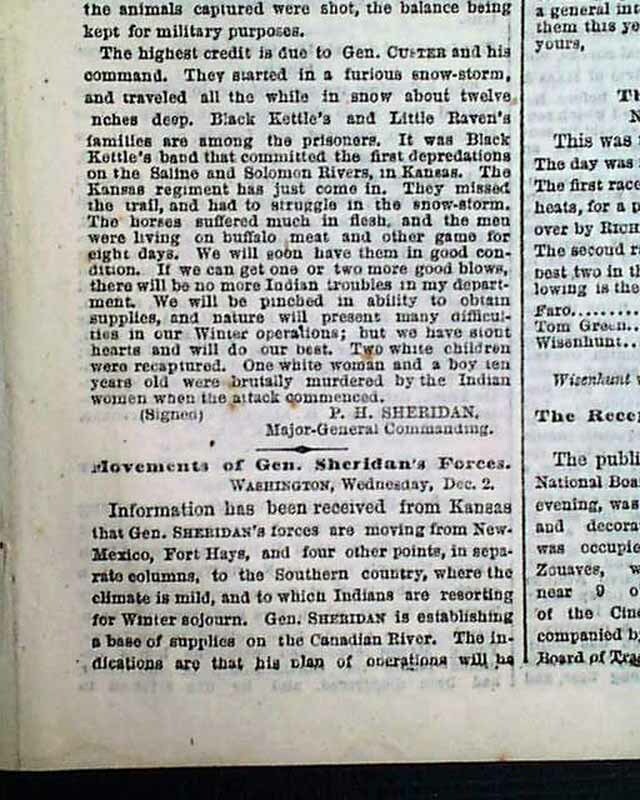 Says that Gen. Sheridan's official report about the recent battle between "Gen. Custar's" forces and the Indians was received at the War Dept. 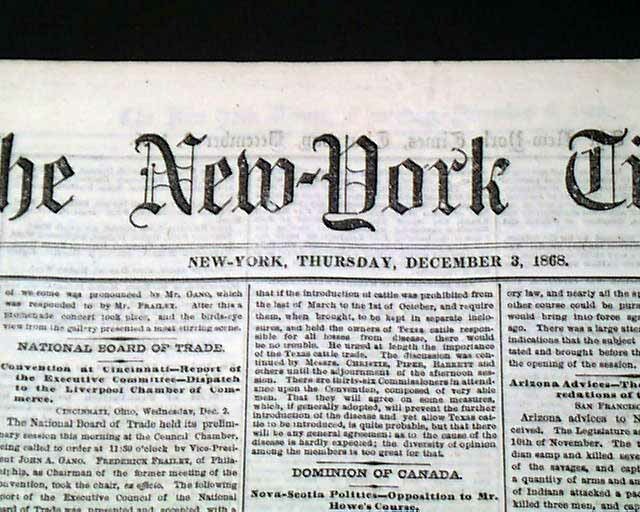 along with a dispatch from Gen. Sherman. 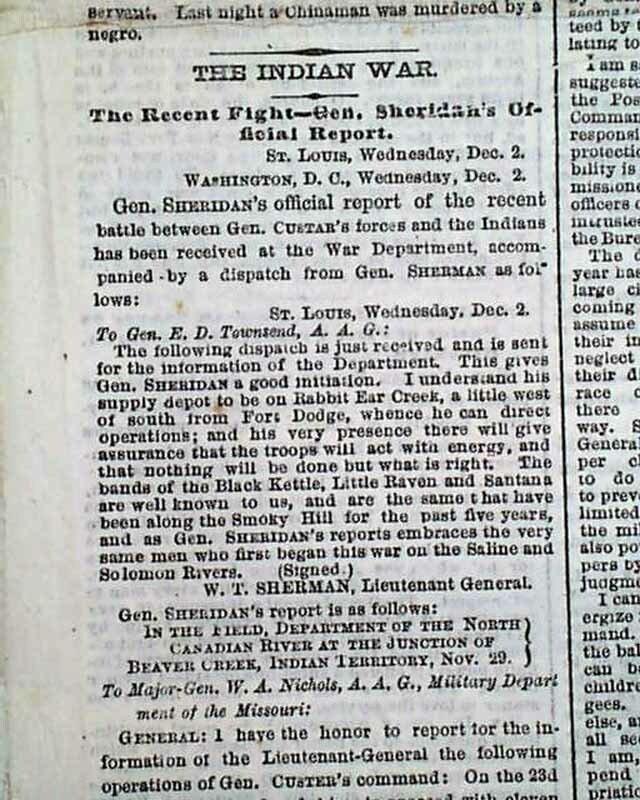 Includes Sherman's dispatch, signed in type: W. T. Sherman, followed by Sheridan's official report about the famous and controversial battle (many say a massacre) at Washita executed under the command of Gen. George A. Custer. 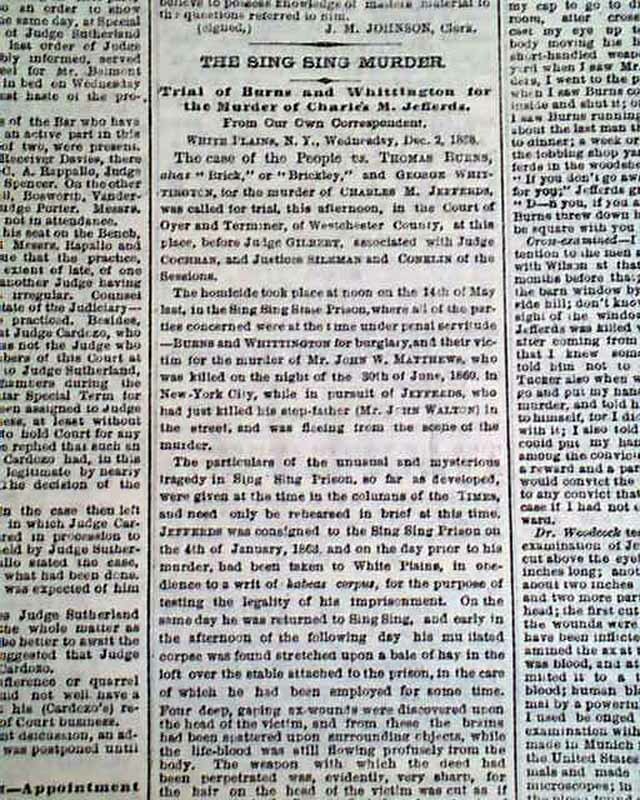 The report mentions Custer as well as Black Kettle, Little Raven & Santana, signed in type: P. H. Sheridan. Other news of the day throughout. 8 pages in good condition. 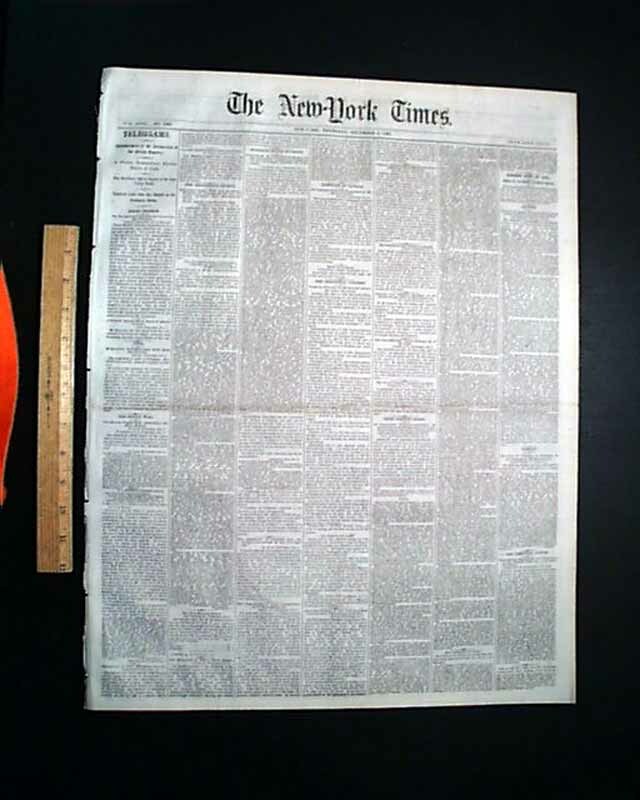 wikipedia notes: On November 27, 1868 Custer’s Osage Nation scouts located the trail of an Indian war party. Custer followed this trail all day without break until nightfall. Upon nightfall there was a short period of rest until there was sufficient moonlight to continue. Eventually they reached Black Kettle’s village. Custer divided his force into four parts, each moving into position so that at first daylight they could all simultaneously converge on the village. At daybreak the columns attacked, just as Double Wolf awoke and fired his gun to alert the village; he was among the first to die in the charge. The Indian warriors quickly left their lodges to take cover behind trees and in deep ravines. Custer was able to take control of the village quickly, but it took longer to quell all remaining resistance. Black Kettle and his wife, Medicine Woman Later, died while fleeing on a pony, shot in the back. Following the capture of Black Kettle's village Custer was soon to find himself in a precarious position. As the fighting was beginning to subside Custer began to notice large groups of mounted Indians gathering on nearby hilltops. He quickly learned that Black Kettle's village was only one of the many Indian villages encamped along the river. Fearing an attack he ordered some of his men to take defensive positions while the others were to gather the Indian belongings and horses. What the Americans did not want or could not carry, they destroyed (including about 675 ponies and horses, 200 horses being given to the prisoners). Prior to the battle, Custer had ordered his men take off their greatcoats so they would have greater maneuverability. Rations were also apparently left behind. Custer left a small guard with the coats and rations but the Indian attackers were too numerous and the guard fled, but Indians from the downstream villages who came up to relieve Black Kettle's village were able to capture them. General Custer's command marching to attack the Cheyenne village. Custer feared the outlying Indians would find and attack his supply train so near nightfall he began marching toward the other Indian encampments. Seeing that Custer was approaching their villages the surrounding Indians retreated to protect their families from a fate similar to that of Black Kettle's village. At this point Custer turned around and began heading back towards his supply train, which he eventually reached. Thus the Battle of Washita was concluded. In his first report of the battle to Gen. Sheridan on November 28, 1868, Custer reported that by "actual and careful examination after the battle," the bodies of 103 warriors were found — a figure echoed by Sheridan when from Camp Supply he relayed news of the Washita fight to Bvt. Maj. Gen. W.A. Nichols the following day. In fact, no battlefield count of the dead was made. Rather, Custer's count was based on consultations with his officers on the evening of the day following the battle, after the soldiers made camp during their march back to Camp Supply. Cheyenne and other Indian estimates of the Indian casualties at the Washita, as well as estimates by Custer's civilian scouts, are much lower. 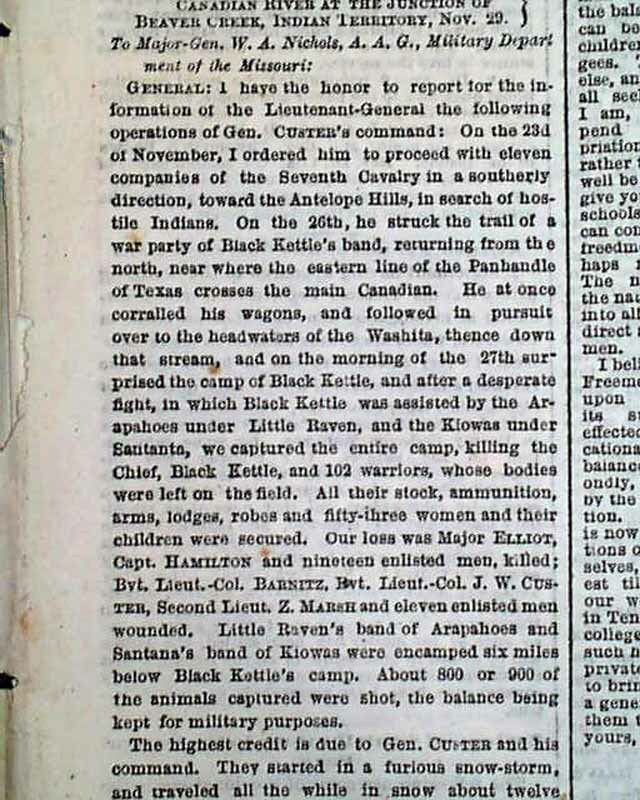 According to a modern account by the U.S. Army Center of Military History, the 7th Cavalry lost 21 officers and men killed and 13 wounded in the Battle of the Washita, with the Indians losing perhaps 50 killed and as many wounded. Twenty of the soldiers killed were part of a small detachment led by Major Joel Elliott, who was among the dead, and who had separated from the three companies he led (apparently without Custer's approval and crying out "Here's for a brevet or a coffin!") to pursue an escaping group. Elliott and his men ran into a mixed party of Cheyenne, Kiowa, and Arapaho warriors from villages up the river and who were rushing to aid Black Kettle's beleaguered encampment;  the warriors overwhelmed the small troop in a single rush. Custer's abrupt withdrawal without determining the fate of Elliott and the missing troopers further darkened Custer's reputation among his professional peers and caused deep resentment within the 7th Cavalry that never healed.